^ Mismatch in orbital longitude of the inner body, as compared to its position at the beginning of the cycle（with the cycle defined as n orbits of the outer body – see below）. Circular orbits are assumed（i.e., precession is ignored）. ^ The time needed for the mismatch from the initial relative longitudinal orbital positions of the bodies to grow to 180°, rounded to the nearest first significant digit. ^ The probability of obtaining an orbital coincidence of equal or smaller mismatch by chance at least once in n attempts, where n is the integer number of orbits of the outer body per cycle, and the mismatch is assumed to vary between 0° and 180° at random. The value is calculated as 1-（1- mismatch/180°）^n. The smaller the probability, the more remarkable the coincidence. This is a crude calculation that only attempts to give a rough idea of relative probabilities. ^ The two near commensurabilities listed for Earth and Venus are reflected in the timing of transits of Venus, which occur in pairs 8 years apart, in a cycle that repeats every 243 years. 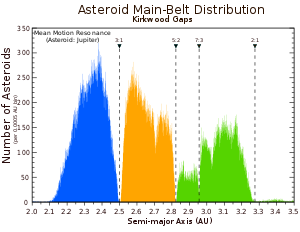 ^ The near 1:12 resonance between Jupiter and Earth causes the Alinda asteroids, which occupy (or are close to) the 3:1 resonance with Jupiter, to be close to a 1:4 resonance with Earth. ^ This near resonance has been termed the Great Inequality. It was first described by Laplace in a series of papers published 1784–1789. ^ 87 Sylvia is the first asteroid discovered to have more than one moon. ^ This resonance may have been occupied in the past. ^ Some definitions of centaurs stipulate that they are nonresonant bodies. ^ The results for the Haumea system aren't very meaningful because, contrary to the assumptions implicit in the calculations, Namaka has an eccentric, non-Keplerian orbit that precesses rapidly (see below). Hiʻiaka and Namaka are much closer to a 3:8 resonance than indicated, and may actually be in it. 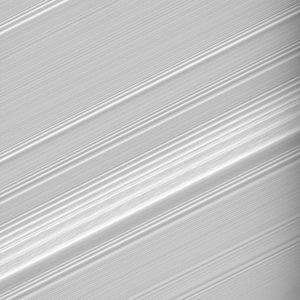 ^ Beatty, J. K. Why Is Saturn Tipsy?. SkyAndTelescope.Com. 2003-07-23 [2009-02-25]. ^ Laskar, J. Chaotic diffusion in the Solar System. Icarus. 2008-03-18, 196 (1): 1–15. Bibcode:2008Icar..196....1L. arXiv:0802.3371. doi:10.1016/j.icarus.2008.02.017. ^ Renu Malhotra. Pluto's Orbit. 1997 [2007-03-26]. ^ Michael E. Brown. S/2005 (90482) 1 needs your help. Mike Brown's Planets (blog). 2009-03-23 [2009-03-25]. ^ Marcy, Geoffrey W.; Butler, R. Paul; Fischer, Debra; Vogt, Steven S.; Lissauer, Jack J.; Rivera, Eugenio J. A Pair of Resonant Planets Orbiting GJ 876. The Astrophysical Journal. 2001, 556 (1): 296–301. Bibcode:2001ApJ...556..296M. doi:10.1086/321552. ^ Extrasolar Planets Encyclopaedia, KOI-730 互联网档案馆的存檔，存档日期2012-06-16. ^ Beatty, Kelley. Kepler Finds Planets in Tight Dance. Sky and Telescope. 2011-03-05 [2012-10-16]. （原始内容存档于2012-05-29）. ^ Barclay, T.; Rowe, J. F.; Lissauer, J. J.; Huber, D.; Fressin, F.; Howell, S. B.; Bryson, S. T.; Chaplin, W. J.; Désert, J.-M.; Lopez, E. D.; Marcy, G. W.; Mullally, F.; Ragozzine, D.; Torres, G.; Adams, E. R.; Agol, E.; Barrado, D.; Basu, S.; Bedding, T. R.; Buchhave, L. A.; Charbonneau, D.; Christiansen, J. L.; Christensen-Dalsgaard, J.; Ciardi, D.; Cochran, W. D.; Dupree, A. K.; Elsworth, Y.; Everett, M.; Fischer, D. A.; Ford, E. B.; Fortney, J. J.; Geary, J. C.; Haas, M. R.; Handberg, R.; Hekker, S.; Henze, C. E.; Horch, E.; Howard, A. W.; Hunter, R. C.; Isaacson, H.; Jenkins, J. M.; Karoff, C.; Kawaler, S. D.; Kjeldsen, H.; Klaus, T. C.; Latham, D. W.; Li, J.; Lillo-Box, J.; Lund, M. N.; Lundkvist, M.; Metcalfe, T. S.; Miglio, A.; Morris, R. L.; Quintana, E. V.; Stello, D.; Smith, J. C.; Still, M.; Thompson, S. E. A sub-Mercury-sized exoplanet. Nature. 2013-02-20 [2013-02-21]. Bibcode:2013Natur.494..452B. ISSN 0028-0836. arXiv:1305.5587. doi:10.1038/nature11914. ^ 23.0 23.1 23.2 Langford, Peter M. Transits of Venus. La Société Guernesiaise Astronomy Section web site. Astronomical Society of the Channel Island of Guernsey. September 1998 [2012-03-01]. ^ 25.0 25.1 Shortt, David. 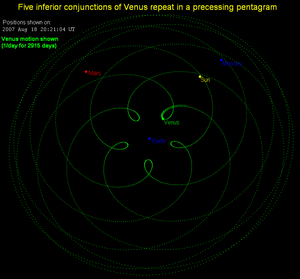 Some Details About Transits of Venus. Planetary Society web site. The Planetary Society. 22 May 2012 [22 May 2012]. ^ Kovačević, A. B. Determination of the mass of Ceres based on the most gravitationally efficient close encounters. Monthly Notices of the Royal Astronomical Society. 2011-12-05, 419 (3): 2725–2736. Bibcode:2012MNRAS.419.2725K. arXiv:1109.6455. doi:10.1111/j.1365-2966.2011.19919.x. ^ Goldreich, P. An explanation of the frequent occurrence of commensurable mean motions in the solar system. Monthly Notices of the Royal Astronomical Society. 1965, 130 (3): 159–181 [2012-11-07]. Bibcode:1965MNRAS.130..159G. ^ Zhang, K.; Hamilton, D. P. Orbital resonances in the inner neptunian system: I. The 2:1 Proteus–Larissa mean-motion resonance. Icarus. 2007-06, 188 (2): 386–399. Bibcode:2007Icar..188..386Z. ISSN 0019-1035. doi:10.1016/j.icarus.2006.12.002. ^ Zhang, K.; Hamilton, D. P. Orbital resonances in the inner neptunian system: II. Resonant history of Proteus, Larissa, Galatea, and Despina. Icarus. 2008-01, 193 (1): 267–282. Bibcode:2008Icar..193..267Z. ISSN 0019-1035. doi:10.1016/j.icarus.2007.08.024. ^ 36.0 36.1 36.2 36.3 Matson, J. New Moon for Pluto: Hubble Telescope Spots a 5th Plutonian Satellite. Scientific American web site. 11 July 2012 [12 July 2012]. 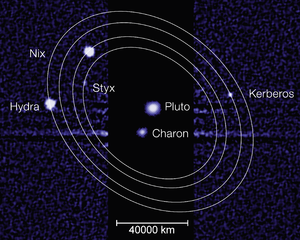 ^ 37.0 37.1 Ward, William R.; Canup, Robin M. Forced Resonant Migration of Pluto's Outer Satellites by Charon. Science. 2006, 313 (5790): 1107–1109. Bibcode:2006Sci...313.1107W. PMID 16825533. doi:10.1126/science.1127293. C. D. Murray, S. F. Dermott (1999). Solar System Dynamics, Cambridge University Press, ISBN 978-0-521-57597-3. Renu Malhotra Orbital Resonances and Chaos in the Solar System. In Solar System Formation and Evolution, ASP Conference Series, 149（1998）preprint. Renu Malhotra, The Origin of Pluto's Orbit: Implications for the Solar System Beyond Neptune, The Astronomical Journal, 110（1995）, p. 420 Preprint. Lemaître, A. Resonances: Models and Captures. (编) Souchay, J.; Dvorak, R. Dynamics of Small Solar System Bodies and Exoplanets. Lecture Notes in Physics 790. Springer. 2010: 1–62. ISBN 978-3-642-04457-1. doi:10.1007/978-3-642-04458-8.